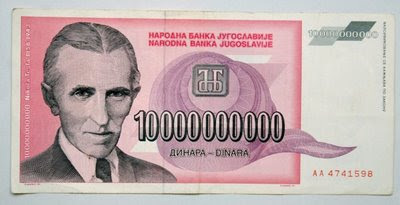 Dr. Thayer Watkins, an economist, has a sobering article, "The Worst Episode of Hyperinflation in History: Yugoslavia 1993-94." The criminal leaders and central bankers of that nation began printing up massive amounts of money to deal with their runaway spending. This led to incredible social turmoil and loss. "Between October 1, 1993 and January 24, 1995 prices increased by 5 quadrillion percent. That's a 5 with 15 zeroes after it." That's a 10 billion dinar note (high-res version purchased from iStockphoto.com for use in my forthcoming book, Conquering Innovation Fatigue through John Wiley & Sons). I think it was good for a couple loaves of bread at the time. There was even a 500 billion dinar note printed that you can see in Dr. Watkins' article. I'd like to know if there is anything fundamentally different between what Yugoslavian tyrants did to destroy their economy and what our leaders are doing right now. Did any of you notice that the outrageous national debt - the result of decades of corruption and malfeasance - was DOUBLED in the past few months by our current leaders? Adding 5 trillion dollars to our debt, creating hundreds of billions of dollars of new money every month, selling out our future, taking the money of all working people to dump into the black holes of greed and failure without accountability -- the impact of such corruption and greed cannot be escaped. We are witnessing the largest theft and financial mismanagement in the history of the world - and the solution being proposed by the next guy coming into power is more of the same (swiping up another trillion dollars from US citizens to provide "stimulus" - an approach that is guaranteed to fail and further erode our economy and freedoms). No one seems to ask the question: Who is benefiting from all this debt? Who is reaping the rewards of our insolvency? And how can we survive if this keeps up? When hyperinflation or other economic and political calamities strike, it can be swift and violent. It can take everything you have and everything you have worked for. Take these things seriously and prepare now while you can. I don't think you'll regret building up your food storage. I also don't think you'll regret putting part of your assets into something that won't evaporate if the CEO is a crook, if the company is Ponzi scheme, if China decides to abandon the US dollar, or if the national debt and the amount of US dollars created from thin air triples in 2009. The socialist paradise of Yugoslavia and its economic failure is something we should study. Ditto for the Weimar Republic and, more recently, Zimbabwe, whose corrupt leader and source of their devastating hyperinflation was praised by our media as an almost Messianic figure who came to save the people of that now hopeless nation. No apologies now for their past endorsement of Mugabe. The lessons, though, are worth learning. You won't learn them from the New York Times. Update: Yes, we are currently experiencing monetary deflation, as the vast amounts of money are being pulled out of circulation and the huge new quantities being created are dumped into banks that aren't using it for anything except protecting their solvency (plus throwing some lavish parties, issuing a few massive bonuses, and lobbying Congress to give them even more). The momentary failure of the newly created money to be put into circulation, however, is like water accumulating behind a loose earthen dam. Eventually it is going to flow again, and when it does, the vast creation of fiat money will lead to massive inflation. Temporary, transient deflation, yes, but inevitably followed by a tsunami of inflationary forces that will make bring us closer to the Zimbabwe model - for we are following their path in financial stewardship. Howard Ruff's article, "Keynesian Economics Works - Sometimes!" explains it well, in my opinion. In further pondering recent post on a word print study alleging confirming the bogus Spalding/Rigdon theory for Book of Mormon authorship, I am also rather puzzled about the treatment of Isaiah and Malachi. In this study, chapters of the Book of Mormon are compared to seven authors, one of whom is the composite KJV text of Isaiah and Malachi. I've already mentioned my trouble with comparing Isaiah chapters to a body of text that includes same chapters. Since nearly 1/3 of the control KJV text for Isaiah/Malachi includes the test chapters from the Book of Mormon, I'm not impressed when the authors report (p. 8) that 20 of the 21 Isaiah/Malachi chapters in the Book of Mormon are found to be closer to the KJV text of Isaiah/Malachi than the other 6 candidates considered. However, the current printing of the Book of Mormon has 22 chapters taken from Isaiah and Malachi. At first I thought the difference might be that the 1830 Book of Mormon had the two Malachi chapters, now 3 Nephi 24 and 25, in a single chapter (then 3 Nephi 11). But the authors state that they are using the current chapter divisions, just applied to the 1830 text. So unless I'm counting wrong, there should be 22 chapters assigned to Isaiah and Malachi (2 in 1st Nephi, 16 in 2 Nephi, 1 in Mosiah, and 3 in 3rd Nephi). Am I missing something? Must be, because after talking about the 21 chapters from Isaiah of Malachi on page 8, the authors later refer to the 21 chapters from Isaiah (apparently Isaiah alone), and then later make this slightly awkward statement: "The actual Isaiah-Malachi percentage can be estimated at around 36 chapters, or 15% of all chapters." They've identified 16 additional chapters that they say are "related" to Isaiah ("another sixteen that have some relationship to Isaiah or Malachi" - p.8), giving Isaiah a lot more credit that he is due. Some relationship? Which chapters, and what relationship? Excuse me, but I sense a strained effort to expand the role of Isaiah in the text. Why might that be? Well, while we have 20 of 21 (22?) known Isaiah/Malachi chapters that the author's methodology preferentially links to Isaiah/Malachi over the other six unlikely candidates, that methodology also links a lot of other chapters to Isaiah/Malachi as well. The "delta probability" method (one of two methods considered) assigns gives Isaiah/Malachi first place for 112 of the 239 chapters of the Book of Mormon (more than Rigdon's and Spalding's winnings combined! ), and second place for 54 more chapters. Ouch. The authors downplay the delta method for too many false positives for Isaiah/Malachi, and give preference to the NSC method ("Nearest Shrunken Centroids" or simply "shrunken 'roids"), which gives first place to only 63 chapters (comfortably less than Rigdon's 93 but still unpleasantly more than Spalding's 52). Sixty-three chapters assigned to an ancient Semitic writer (technically, the combined voice of Isaiah + Malachi, dominated by Isaiah) - that's a lot more than 21, and still a lot more than an inflated 36 or so chapters. The authors downplay these false positives and emphasize how often Rigdon and Spalding show up in either 1st or 2nd place using the shrunken 'roids approach. Have they adequately explained away the relatively strong presence of the voice of Isaiah/Malachi in the text? Those extra chapters assigned to Isaiah's voice are especially strong in the first part of the Book of Mormon (1st and 2nd Nephi), where Nephi is writing. They are essentially absent in the middle of the Book of Mormon, and rise again in the last part (3rd Nephi, for example). OK, the whole methodology is questionable and should not be taken too seriously, but I just find it ironic that the ancient Semitic voice of Isaiah/Malachi turns out to be stronger than expected in this study - something that must be vigorously downplayed. Don't want to suggest that there might be any ancient Semitic influences in the text other than quoting Isaiah and writing in KJV style. But if writing in KJV style or about Old Testament themes is enough to give dozens of false positives to an ancient Semitic writer, as the authors suggest, then is the word print methodology they are using really relying on non-contextual elements that have any meaning in identifying links to candidate authors? While receiving a cherished Christmas missionary phone call from my son in Taiwan yesterday, a Hmong woman and her daughter showed up at our house with hot egg rolls - the best ever - and some other treats, including her special sweet rice dish wrapped in banana leaves. She looked so happy to be doing something nice for us - she was just glowing. The food was exceptionally good! Meanwhile, I was anxiously awaiting word from Anchorage, Alaska where one of my favorite Hmong families just arrived without really knowing what they were getting into. How grateful I was to find out that there is a Hmong branch in Alaska and Hmong-speaking missionaries who might be able to help them. A great relief. In talking with friends from Mexico, Laos, India, Montenegro and China in the past few weeks, the challenges of being an immigrant in a strange land have been impressed upon me in several ways. There is so much that can be achieved with a little advice, a little help, a few donated items, or a some legwork on their behalf. In thinking about the challenges of immigration, I fondly recall one of my favorite Christmas experiences based on a simple but very kind donation from a member of our ward. I relate "The Miracle of the Pink Coat" in a 2005 blog post. For my friends in Alaska, how grateful I am that there will be "instant family" waiting for them in the marvelous fellowship that comes from membership in the Church of Jesus Christ of Latter-day Saints. Thanks to the Saints in Anchorage for already reaching out and helping the newcomers in your midst! Thanks to all of you who help the poor and needy around you, many of whom are strangers from afar who need a friend. What a great time to remember our own immigrant status as pilgrims and strangers in this foreign mortal world, anxious to return to our Heavenly Father's presence. Meanwhile, we all have work to do to bless and strengthen one another. That New Book of Mormon Wordprint Study: The Criddle Riddle - or Rigged for Rigdon? A new wordprint study on the Book of Mormon breathes new life to a long-challenged theory for Book of Mormon authorship, the theory that its real author was Solomon Spalding secretly assisted by Sidney Rigdon. The just-published peer-reviewed study is "Reassessing Authorship of the Book of Mormon Using Delta and Nearest Shrunken Centroid Classification" by Matthew L. Jockers, Daniela M. Witten, and Craig S. Criddle. It's certainly an interesting read, though be warned that accessing the article costs $28. It's worth the price (if you're intrigued by wordprint studies), and purchasing access also allows you to download the large data matrix used by the authors and some supporting information. This is a study that demands some attention, in my opinion. Dr. Jockers, a Consulting Assistant Professor in the English Dept. at Stanford, has excellent experience in applying digital tools to the humanities. Daniela M. Witten is a Ph.D. student in statistics at Standford. Craig S. Criddle, the primary inspiration for the study, is a former Mormon who has long advocated the theory that Sidney Rigdon and Solomon Spalding were the real authors of the Book of Mormon. He maintained this in spite of extensive problems with the theory that has led some critics of the Book of Mormon to abandon this theory as hopeless. However, he is openly aware of his bias and I believe has sincerely tried to ensure that the number crunching and analysis was done fairly by others. That's healthy. Mr. Criddle has put the Rigdon/Spalding theory to the test -- at least in his view -- by comparing word usage in Book of Mormon chapters to a handful of modern authors to see which modern author's style is closest to those in the Book of Mormon. This is the critical gap that seems to have confused a few people about this study. It is not a statistically valid test measuring the probability that either Solomon Spaulding or Sidney Rigdon is the author of a particular chapter, but a test that simply determines which of a tiny handful of authors (Joseph Smith excluded!) comes closest in style to each chapter of the Book of Mormon. Two somewhat related techniques are used to compare word frequency characteristics: the "delta" method and the "nearest shrunken centroids" method (sometimes affectionately abbreviated as the "shrunken 'roids" model). These methods look at the frequency of simple non-contextual words (words like "of", "the", and "and" whose usage typically doesn't vary strongly as a function of the topic or context of writing) and compare stats from chapters in the Book of Mormon to characteristics obtained for text from each of the candidate authors. At first glance, I was astonished to see individual chapters of the Book of Mormon being assigned authorship with high probabilities. You can't do that with such a small sample - but it was my mistake, for again, they are simply ranking each of the 7 candidates relative to that passage and seeing who comes closest. You can do that for a single verse or sentence, if you wanted, and always have a winner -- but not necessarily a meaningful result. The candidates in question DO NOT include Joseph Smith. The authors argue that he relied too much on scribes and that we don't have a large amount of text that we know came from him. In my opinion, it seems that they aren't even trying. Why not at least use some of his handwritten letters, and some of the early versions of his revelations in the Doctrine & Covenants? Why not try? I have to wonder if it is because they have already ruled out Joseph based on their preconceived notions, which are key to the Spalding theory. While wordprint studies have sometimes been likened to fingerprints, with the ability to detect unique aspects of a writer's style, the reality of statistical analysis of human text makes it difficult to have sufficient power to uniquely identify authorship, especially for small chunks of text like an individual chapter in the Book of Mormon. Larger blocks are typically required, and great care must be taken to account for complicating factors and the high variability that occurs in writing. For her master's degree thesis in statistics, my wife, Kendra Lindsay, used computational wordprint tools to assess authorship of several Pauline epistles using Greek texts. It was difficult work leaving several areas unresolved, but raised the issue that large differences in style among the Pauline works might be due to multiple authorship in some cases or other influences. She has not yet had time to review the new Book of Mormon study, and I'm not sure she is all that interested (she'd want to redo analyses, etc. ), so for now you're just getting my superficial non-expert views. Being the "winner" among a pool of seven is a far cry from being proven to be the actual culprit. In the case at hand, the authors have a pool of 7 where victory can be proclaimed if the results point to either of two authors (well, four if we include Oliver Cowdery and Isaiah/Malachi) gaining the first or second place slot. For the 239 chapters of the Book of Mormon, the NSC ("shrunken 'roids") method assigns 1st place Cowdery 20 times, Pratt 9 times, Rigdon 93 times, Spalding 52 times, Isaiah/Malachi 63 times, Barlow 0 times, and Longfellow 2 times. The delta method gives Cowdery 5 chapters, Pratt 7, Ridgon 63, Spalding 47, Isaiah/Malachi 112, Barlow 0, and Longfellow 5. In fact, Isaiah and Malachi are assigned to far more chapters than I would expect, but this is downplayed. 21 of 22 chapters taken from Isaiah or Malachi are properly assigned to Isaiah and Malachi, which is nice (Isaiah 53, quoted by Abinadi, was assigned to Longfellow). But I believe the Isaiah/Malachi control text included the chapters that were being compared to it; if so, it's not terribly impressive. What would happen if we applied a similar approach to solving a crime? Someone has been shot. Evidence from witnesses and crime scene data suggests that the killer may have been male, with dark hair, over 5 feet tall, had a scar on his cheek, and drove a red Honda. The police round up 7 people from the area who could be suspects, including two suspects they don't like and think could have done it. The two suspects are males with dark hair who were in the vicinity of the crime. The prosecuting attorney brings in a college professor who did a study comparing the evidence to the seven people, a pool that includes the two suspects plus three short female blondes, one short male blonde, and a short female redhead. None drive a Honda; none have scars on their cheek. The professor explains that careful testing and analysis has confirmed that the two suspects match the evidence far better than any of the other suspects. He goes through the Digital Hair Color Test, complete with detailed image analysis and computation color assessment. The two suspects are pegged with 99% probability. Then there is the Laser Height Test. A laser altimeter is user to determine that the two suspects have been selected as the best fits in terms of height with 99% probability. Then we have the Biomolecular Gender Test. Advanced DNA testing is used, and three of the candidates are selected with over 85% probability (some uncertainty arises from an extra chromosome), and sure enough, both of the main suspects are in this group of three males. Putting everything together, there is an overwhelming probability that the two suspects are the murderers, the jury is told. Should they convict? In the Criddle study (and it deserves to be called the Criddle study, for he is the driving force for this work, for its assumptions, and for the hypothesis being tested), every chapter is going to have a winner, using this technique. Any randomly selected group of candidates can result in claims that at least one of them is the "guilty party" with this methodology. No matter how dissimilar the styles, how far apart the two texts may be, the method forces each chapter to be assigned to one of the 7 candidates as the best fit. It is entirely possible that Jeff Lindsay could be assigned as the author of numerous chapters of the Book of Mormon if my works were thrown into the mix, using the approach in the Criddle study. My own works could be assigned to Sidney Rigdon as well if there were compared to him and several other more dissimilar authors, with me being left out of the mix. What would that prove? Surely Mr. Criddle and his friends must understand that this work is guaranteed to pick a winner every time from one of the seven candidates, regardless of how close their style actually is to the Book of Mormon, and that great caution must thus be exercised in drawing conclusions about actual authorship just because a dominant winner is found. Rigdon, Spalding, and Cowdery have styles that are closer to the Book of Mormon than, say, the poetry of Joel Barlow or Longfellow -- but this says little about the true authorship of the Book of Mormon (though perhaps it helps us rule out Barlow and Longfellow). Mormon prophet Joseph Smith (1805--44) claimed that more than two-dozen ancient individuals (Nephi, Mormon, Alma, etc.) living from around 2200 BC to 421 AD authored the Book of Mormon (1830), and that he translated their inscriptions into English. Later researchers who analyzed selections from the Book of Mormon concluded that differences between selections supported Smith's claim of multiple authorship and ancient origins. We offer a new approach that employs two classification techniques: ‘delta' commonly used to determine probable authorship and ‘nearest shrunken centroid' (NSC), a more generally applicable classifier. We use both methods to determine, on a chapter-by-chapter basis, the probability that each of seven potential authors wrote or contributed to the Book of Mormon. Five of the seven have known or alleged connections to the Book of Mormon, two do not, and were added as controls based on their thematic, linguistic, and historical similarity to the Book of Mormon. Our results indicate that likely nineteenth century contributors were Solomon Spalding, a writer of historical fantasies; Sidney Rigdon, an eloquent but perhaps unstable preacher; and Oliver Cowdery, a schoolteacher with editing experience. Our findings support the hypothesis that Rigdon was the main architect of the Book of Mormon and are consistent with historical evidence suggesting that he fabricated the book by adding theology to the unpublished writings of Spalding (then deceased). Wow. I want to be tactful here, for I appreciate the efforts put forth to understand the Book of Mormon in this study. But if I understand what has been done, this study does not determine the probability that any of the potential candidates had anything to do with the Book of Mormon. It determines the probability that one candidate is closer to some metrics of Book of Mormon style than another candidate from an extremely limited pool that excludes the most likely modern candidate, Joseph Smith (though adding him might not have made any difference). But saying that Sidney Rigdon is closer to the style of, say, 2 Nephi 10, than Orson Pratt or Henry Longfellow tells us nothing about who wrote 2 Nephi 10. Unwittingly, the nature of this study may make it, in retrospect, inherently rigged for Rigdon/Spaulding/Cowdery. Maybe Ridgon + Spalding would have been the best fit even if hundreds of other possibilities had been tested, but that remains to be seen (actually, the wordprint work of Hilton et al. has already raised serious and highly credible questions challenging Spalding as a potential author of the Book of Mormon). One positive aspect of this study: the results are consistent with the concept of multiple authorship. Some chapters are assigned to Spalding, some to Ridgon, and some to Cowdery, though it's possible that none of these authors have styles close enough to the Book of Mormon to be a genuine candidate for authorship with more confidence than the hypothesis of multiple ancient authors with different styles translated by a single modern author in a way that allowed some subtle non-contextual stylistic differences to persist. If we can learn anything from the work, it may be that one source or one author alone may not reasonably account for the differences in style. Of course, that's something some Mormons - including authors of previous wordprint studies - have been saying for quite a while. A couple minor nitpicks. I opened up the 40+MB text file with data from all the authors and Book of Mormon. Did a couple of quick checks to see if there were any major problems - didn't see any. I picked a few chapters of the Book of Mormon and looked to make sure some unique words were represented. Out of about 15 tries, I found only 1 problem. The word "rehearsed" in 2 Nephi 1:1 has been missed. The column for "rehearsed" (and for all related forms of the word) show 0 counts in 2 Nephi 1. I think it's worthwhile to do some further checking of data integrity. I would also suggest that the computerized text needs to be cleaned up. Some of the words have been "fouled" by punctuation. For example, "--wherefore" shows up as a distinct word, in addition to "wherefore". Only a couple hundred words in the entries for the Book of Mormon fall into these "fouled" categories in the initial columns of the spreadsheet, but it suggests that the computerized data perhaps weren't scrutinized and corrected. It's possible that they might make a difference somewhere, but I would expect it to be minor. This is my first response to this work and will require updating as I get more time. I may be wrong on several counts and will strive to correct any mistakes as I learn more. As always, do your own homework and don't rely on error-prone amateurs like me. Fortunately, errors in these matters aren't unique to Mormon apologists, and sometimes creep into the works of our critics, no matter how sincere and careful they have tried to be in advancing alternate theories for Book of Mormon authorship. Update: Blair Dee Hodges provides an excellent discussion of the wordprint study on his blog, Life on Gold Plates. I've just added this blog to my blogroll to the right. Blair offers detailed, well researched and carefully written posts on meaningful topics. He has done a tremendous service with his notes from the 2008 FAIR Conference, for example. I was also pleased and enlightened with his treatment of the rumor about Joseph Smith allegedly saying the telestial kingdom was so wonderful that people would be tempted to commit suicide to get there if they saw it. Thanks, Blair! One of the most surprising things about the LDS experience is how common it is for members to experience the hand of the Lord in their lives when they muster the faith to pay tithing. At least I am genuinely surprised by it. I see people blessed in many ways when they strive to keep the teachings of the Gospel. Every teaching and principle the Lord has given us is there to bless our lives: morality, honesty, prayer, reading the scriptures, honoring the Sabbath day, the Word of Wisdom, avoiding debt, clean language, spending time with your kids, ministering to others through home or visiting teaching -- all of these can make our lives better and faith-solidifying miracles can occur as we exercise faith to follow the Lord in such matters. But I am intrigued by the seemingly high proportion of faith-promoting stories that come when people make the transition to becoming tithe payers. Is this just my observation, or do you see this also? In the midst of our pleasure in having a newer car, we wondered what to do with the orange car. Yes, it was ugly, but the engine ran reliably. We could get a few dollars for it at a junkyard, but we both felt we should look for someone to whom we could give it. On Sunday morning I went into the clerk's office to ask the ward clerk if he needed a car. He and his wife had several teens. He smiled and said no thanks; he didn't need another car. In the corner of the office, however, was a ward member writing something. He perked up at the mention of a car, so I went through the long list of things that didn't work. But I assured him it had good tires, the engine was reliable, and it couldn't be too bad since it had always been driven by a full-tithe payer. He and his wife had only one car, and he worked nights while she worked days. He had turned down better employment opportunities because he would have needed the car when his wife also needed it. A second car would permit them to increase their income and open up advancement potential for him. So we gave them the old orange car. This would have remained just a fond memory if it hadn't been for our conversation three months later. This ward member and his wife wanted us to know more about their circumstances when we gave them the car. As is often the case with young couples, money was scarce, and with the birth of their first child, expenses had increased more rapidly than income. They had gotten behind in their tithing and had felt awful about it. With each passing month they felt worse, but they didn't see a way out of their dilemma. They had gone six months without paying tithing, and they had prayed and felt that they just had to make things right with the Lord. That Sunday morning when I walked into the clerk's office, he had been writing out his tithing check, wondering how he was going to meet his financial obligations through the coming month. My first thought was embarrassment at my joke about the car having been driven by a full-tithe payer. But as I reflected on the situation, I marveled at how the Lord keeps His promises when we keep ours. The ink wasn't even dry on his check when the means to resolve his dilemma unwittingly walked through the door. I have often looked back at the example of faith shown by this young couple. It comforts me to know that if I show faith, someone somewhere can be in the right place at the right time to help solve my dilemmas. How grateful I am for a Father in Heaven who knows us so well that He can bless us even before we have finished demonstrating our faith. We hear these kind of stories, but they don't apply to everyone by any means, even if they are surprisingly frequent. There are also some stories where people make a huge sacrifice to do what's right, and as a result seem to suffer. Some are preserved by the Lord when thrown into a lions den, while others are consumed. We must be prepared for our sacrifice to be a real one, and recognize that any miraculous deliverance or help is unearned and solely through miraculous and exceptional mercy. But the Lord seems to look for opportunities to bless us when we exercise faith. Faith is what it's all about. We pay tithing not because we have enough money, but because we have enough (often just barely enough) faith to follow the Lord in a real and tangible way. Regardless of the outcome, I would encourage you to trust the Lord and obey His universal command to honor Him with the ancient biblical and restored LDS principle of tithing. 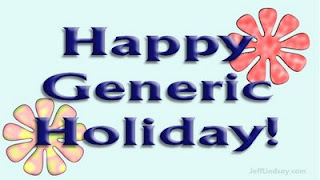 Today I offer a lighthearted greeting from all of us out here in Zion, a.k.a. Appleton, Wisconsin. Such a fine place to live! One of the best places to raise a family you'll find, in spite of a touch of cold here and there. The 30-second video clip is done with the free Animoto service. Fun to play with. Oops - I don't play, I blog. Sorry for the confusion. Update: Just checked with the Mayor (very cool guy, Tim Hanna - part of a long line of outstanding mayors, including a respected local Latter-day Saint, Dorothy Johnson). Turns our we STILL HAVE OPENINGS in Appleton, so yes, you can move here, if you act fast. 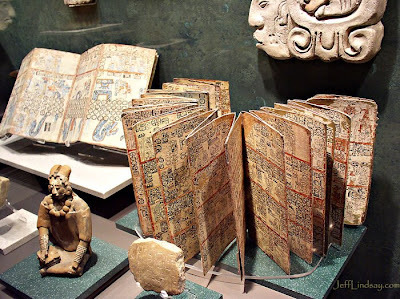 In these photographs that I took in Mexico City's amazing National Museum of Anthropology, we see something exceedingly rare which was one very common -- written books from Mesoamerica. The Spaniards found thousands of books when they arrived in southern Mexico and were alarmed about the potential for blasphemy and Satanic influence in these books that the natives revered so highly. They did the natural politically correct thing and wiped out nearly all traces of that which they did not understand or agree with. Centuries of knowledge were wiped out in the great book burning fires of the Conquistadors. 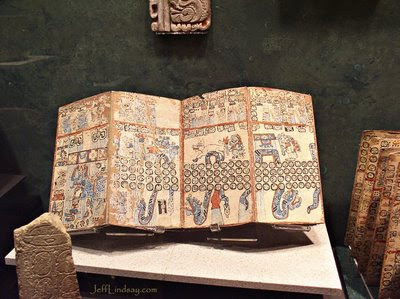 Only a tiny handful of Mayan codices have survived. What a terrible loss! The sacred ancient records we have today, such as the Bible and the Book of Mormon, were preserved at great cost by many looking forward to future generations. Some gave their lives to protect these records and keep them from being destroyed by enemies. Nevertheless, millions today are not allowed to read these sacred volumes in some nations, or are unable due to poor literacy. Others don't want to bother. The Adversary would gladly wipe out our sacred records. What he hasn't achieved through senseless burning he can still achieve in our own lives if we refuse to read, or if we refuse to remember and apply the lessons of scripture. They may ban every reference to the scriptures in our schools, but don't let them be banned from your life. Knowledge of our Savior and the great plan of happiness can be found in them, including the Book of Mormon, one of the most important ancient works from the Americas, miraculously preserved and translated for our benefit today. The Fed and the Treasury are asking all skilled counterfeiters to join in the effort to create as much cash as possible in the next 12 months. Presidential pardons for past and selected future crimes will be issued to qualified participants, a Bush Administration spokesman said. Qualified counterfeiters are asked to bring their goods to a local Federal Reserve Bank, where they will be given 80 cents on the dollar as credit in tax-free electronic accounts that they can use almost anywhere -- Amazon, iTunes, Congress, etc. “America appreciates the skilled help of those who have been augmenting the work of the Federal Reserve Bank for years. Now we ask you to step it up in this time of national emergency,” President Bush said. Recognizing that American counterfeiters may not cooperate to meet the Fed's currency creation goals, economic advisors for President-elect Obama are currently meeting with the Finance Ministry of Zimbabwe to explore collaborative efforts in currency creation. Meanwhile, if you are a skilled counterfeiter of US currency, the US Government is asking that you contact your local Federal Reserve Bank as soon as possible for details on how you can help. Tonight I dropped into CVS Pharmacy to get a family photo made into some Christmas cards. I plugged my USB jump drive into their machine and looked at the choices available for printing cards. There was an option for "Winter Holiday Cards" - OK, that might have Christmas cards. I went there and found nearly a dozen choices of formats to which I could add my photo. There were two cards available with Jewish symbols - the menorah on one and the Star of David on the other (not the Bethlehem star, though - just a repeating background of the Jewish symbol). Cool. There were cards with Santa Claus, presents, and a reindeer. But nothing that was distinctively or uniquely Christian. No wise men, no shepherds, no manger scene, so star of Bethlehem, no angels, no cross, etc. Not even the non-denominational word "Peace." Perhaps that phrase is too loaded with Christian overtones if present on a "winter holiday" card. Does CVS suffer from the delusion that offering a Christian-themed Christmas card would somehow be offensive to their customers looking for "winter holiday" cards, while Jewish symbols are OK? I punted, gently expressed my dismay to the staff, and went online to find some real Christmas cards - plus a few "Happy Bailout" cards for my non-believing but still very gullible friends. Dong Yun Yoon is the Christian immigrant from South Korea whose wife, children, and mother-in-law were killed by a fighter jet that crashed into his home after the pilot bailed out. Instead of the anger and outrage one might expect, he forgave the pilot and expressed concern for his welfare. "I pray for him not to suffer for this action," Yoon said. "I know he's one of our treasures for our country." Wow. A stunning example of a man who follows Christ and understands grace. Such love and composure in the midst of such a tragedy. Is there a fund people can donate to? Anything we can do to help? Thanks, Michelle! And a big hat tip to Scott of ScottSlant. Rewarding and reinforcement of the wrong behaviours occurred at Metropolitan Life, the second largest insurance firm in the USA in the 1990s. In 1993, it was alleged that MetLife agents swindled US$11 million from gullible people who believed that they were purchasing retirement plans. What they thought were savings deposits towards their retirement were actually insurance premiums for insurance disguised as a new type of investment plan. Much of the blame fell on Rick Urso, the Tampa branch manager for MetLife. There were plenty of indicators that Urso's branch was an anomaly. Its budget for mailing brochures was ten times that of any other MetLife offices and from 1989 to 1993 Urso's commission-based salary rose from US$270,000 to over US$1 million (Lohse, 1999; Hartley, 2005). Rather than investigating this performance anomaly, MetLife's response was to award Urso with the Sales Office of the Year Award for two years running, to invite him as a motivational guest speaker at MetLife conferences, and to reward him by promoting him to the position of third highest-paid employee. The organisation was unwilling to see the warning signs and reinforced Urso's behaviour through rewards and public recognition, creating a culture that encouraged replication of dubious sales techniques, costing MetLife over US$1.7 billion in lawsuit payments in 1999. Ouch. Surprisingly good reports should be a cause for some skepticism before we pour out the praise. Hmmm, I wonder if we could get similar problems when it comes to LDS metrics like home teaching stats? Sometimes I worry that praising units with high stats may encourage other units to adopt the same practices. If the great stats come from great efforts to minister to the Saints, that's wonderful. But in one ward I was in, I once heard a cumulative report for one month's home teaching that was higher than possible just based on the two or three people I missed that month, and the fact that we weren't home taught either. Leaders should not take stats too seriously, but should take pains to understand what is happening in the ward to ensure that the fellowship of the Saints really does include abundant fellowshipping and ministry. While stats are always a problem, I am grateful that the Church leaders I've had in my life have generally been real Christians and not sociopaths trying to work their way up in the Church. Personal character seems to be much more important in the Gospel - thank goodness! - than it is in corporations, though my corporate experiences have also been generally positive as well. But sociopaths, like bad stats, can be found in all arenas. Don't be shocked that they exist. 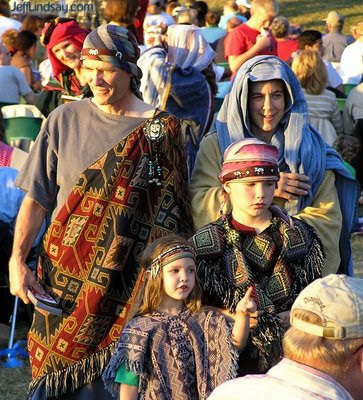 I just ran into this photo I took in 2007 from our visit to the Hill Cumorah Pageant in New York. This is some of the cast, mingling with the audience before the show begins at night. Reminded me that many of you might want to start planning your summer vacation include the pageant. It's a stirring, dramatic production that you'll enjoy, whether you care about the limited geographical model of the Book of Mormon or not (and the ensuing questions about the location of the real Hill Cumorah where a massive army sought an advantage and where Moroni hid everything except the gold plates with the Book of Mormon record). Ever have a spiritual near miss, where the Lord kindly gave you some personal inspiration about a matter where you listened to and responded to the message -- and, though lack of diligence or follow-through, still blew it, barely missing the blessing He was trying to give you? Being in tune and getting personal revelation is not enough -- it can be in vain if we don't follow up with diligent effort on our part. I think we need to learn from our near misses in order to avoid them and have more spiritual "hits" our lives. This morning my wife needed me to do some shopping to help her prepare for the Stake Auxiliary Training session she was running for Primary (the LDS children's organization) leaders in the units of the Appleton, Wisconsin Stake. As Primary President, she does a lot of extra-mile efforts and has spent hours preparing and planning for this day. As crunch time approached, though, she needed a little help to get a few more items for refreshments. I left at 8:30 am with instructions to be back by 9:15 am, when she needed to leave. I ran to a major grocery store and snagged everything needed, and was back on the road by 9:04, just five minutes from home. Success! I felt like I should call her and assure her that I would be back with a few minutes to spare, but passed on that idea, perhaps ignoring a prompting. No need to call, I reasoned - I'll be home soon enough. I came home, expecting to see some frantic last minute rushing, but everything was calm. Cool. We chatted and I helped put a few things away. Then after being home for about five minutes, as I was leaving the kitchen I looked at the big clock on the wall, the one that had shown 8:30 a.m. when I left, and puzzled over the time. It now showed 8:40 a.m., in contrast to my watch that read 9:15 a.m. I casually said to my wife, "Hey, that clock is off. It says 8:40, but it's really about 9:15." She thought I was kidding at first, then looked at her watch - and panic set in. She raised an eyebrow and, with a tense but gentle smile, whispered, "My, my, this could be a keenly inconvenient time for that clock to fail, because now I suppose I'm going to be rather late and my hours of preparation may prove to be futile after all. I thought I was ahead of schedule and so productive, but disaster was looming - courtesy of batteries that suddenly died. Well, isn't this an interesting learning experience? I do hope you'll blog about it. Now please excuse me while I zealously strive to change, do my hair, my makeup, and about 40 other things in the next 30 seconds." Well, those may not be her exact words, but that's how I interpreted her highly nuanced and intricately modulated shriek. It's a marvel how much can be conveyed by the female voice in times like this. Moments after she pulled out of the driveway, she called me and expressed concern that she may have left some things that she needed. My first impression - yes, definitely an impression - was to head to the printer in the basement where I imagined she had printed some documents needed for her event. "I'm heading to the printer. Anything there?" She didn't think so, but I felt that I should look. Ah, there was a stack of colorful primary documents on the desk. I asked her about them, and she said no, she didn't need those. Shouldn't be anything there she needed. OK, I thought. I noted some documents were in the output tray in the printer, but, assured that she didn't need anything, I ignored them and went upstairs. Twenty minutes later, when I was halfway to the church (our Stake Center in Neenah), she called again, hoping I was still home. She realized that some printouts she thought were in her Primary bag were still at home, and hoped I could bring them with me. But I was too far from home now to get them in time to help her. Had I gone the extra six inches to reach into the printer tray and describe what I saw, the impression to head to the printer would have born fruit - and I would score a few extra admiration points. One's account can never be too full. As it was, it was a sad near miss. This is a trivial event in the big scheme of things. Her event was successful, the people she served were grateful, the food she brought was delicious, and life goes on, in spite of some stress and a few glitches. But I could have done a little more to help my wife if I had been a little more diligent and faithful in responding to what may have been a touch of guidance. As I pondered this event, I could see that I've got a stream of near misses in my life, where things went wrong in spite of seeking and receiving helpful inspiration from the Lord, not because of flaws in the guidance, but in the execution. The challenge of turning personal revelation into success is much like the challenge of turning good ideas into successful inventions or commercial products. There's a lot of work that has to come after the idea stage for it to be any good. Revelation plus active faith and diligence is what we need. I grew up on war stories from my father who went from religious apathy to transforming faith through the puzzling miraculous experiences he encountered amidst the daily horror of the Korean War, a ridiculous no-win war fought under direction of the United Nations in which the lives of many our men were wasted. Many puzzling aspects of the war made sense when my outraged father later learned that "secret" US plans had to be pre-approved by a UN office that was headed by officials from Communist nations who obviously shared the plans with the North Koreans. In spite of the futility of this no-win war and the corruption of top leaders who supported it, there was incredible honor and valor among our troops. Their blood was spilt unnecessarily, but they gave their lives to serve their nation, seeking to protect and defend us. My father's real-life stories show how the Spirit can operate and guide people in the midst of carnage and horror. We do not know why some will die and others be spared, but we can learn much from the stories of those who applied their faith and sought the help of God in the brutal scenes of war. In my father's case, his dormant faith was jolted into a commitment to serve God when he finally recognized God's hand in sparing his life time after time. The moment of change came in a foxhole under heavy artillery fire. He heard the whistling of a shell that he sense was "the one." Closer, closer - he covered his head and waited for the explosion that could end his life. There was a thud and then -- nothing. After a few seconds, he opened his eyes, turned around, and saw smoke streaming from a hole in the side of the foxhole, just inches from his back. It was a rare dud. At this moment, he knew almost nothing about the Church, but decided he would go on a mission. That mission would bless him in many other ways -- including bringing a miraculous end to the post-traumatic stress disorder he faced after enduring shelling for many months in the war and facing so much danger daily. There are many other stories he has shared - and some he'd rather not share. Through it all comes a recognition of the hand of God and the importance of listening to the promptings of the Spirit, in both times of war and times of peace. With this background in my life, it's no wonder that I am excited about the new books by John Bytheway, Supersonic Saints: Thrilling Stories from LDS Pilots and Supersonic Saints 2: More Thrilling Stories from LDS Pilots. These are stories written by LDS pilots, many dealing with war. Some are especially gripping and faith promoting, and all are instructive. They include stories of pilots seeking guidance in how to save lives, including their own, the lives of co-pilots in damaged planes, or the lives of possible innocent civilians they don't want to harm. The reality of God and miracles shines through these accounts. These aren't just faith promoting rumors about some unnamed pilot during some war. These are first-hand accounts written by real pilots with names and even biographies at the end of each chapter. The events occur in specific airplanes, on specific missions, with details and supporting information. The powerful story, "Sir, I'm on Fire!" that begins the second book includes verbatim dialog from a miraculous Vietnam War event which is backed up by a copy of the dialog on tape in the pilot's possession, plus text from the June 22, 1972 maintenance log for Aircraft #6358. In this event, the LDS pilot, Gordon Weed, heard the voice of the Spirit telling him to go against all his training in coaching his wingman, Bill Harrell, not to eject from a burning airplane after being hit in a mission over An Loc, near Saigon. It was crazy, but he knew Who was speaking and chose to obey, but was unable to give his wingman good reasons to delay ejection from the burning plane whose fuel tanks or ammunition could explode. The other pilot could have ejected on his own volition, but complied. Doing so saved his life, for it turns out that the fire was from a hit to the flight refueling line in the front of the plane. Once the fuel in the refueling plumbing burned out, the fire was over with no further threat. But had the pilot ejected while the fire was raging, he would have been sprayed with burning fuel and probably killed. Read the full story - it's very dramatic, as are many of the gems in these two volumes. Of the two books, the second has more stories and would probably be my recommendation if you want to read or give a single book. But I recommend reading both. By the way, my father has his own miraculous story involving a flight that could have taken his life. Not a war story, though. Ever wondered why the Book of Mormon, whose purpose is to bring souls to Christ, has such a large fraction of the text describing times of war? Especially in the highly emphasized period in the century before the coming of resurrected Jesus Christ to the Nephites, we encounter lengthy descriptions of war, including details of war tactics, of individual and group heroism, of faithful people relying God to know how to handle the threats they face, of mothers and fathers worried about the lives of their warrior sons, of blessings and miracles coupled with tragedy and grief. Remember, the book was written for our time, edited by a general who saw his wicked nation wiped out in war, and who also saw our day and gave us inspired selections from the Nephite records that would meet our needs. The rigors of peace are not the major challenge of our pre-Millennial era. We need to understand war - how to avoid it, how to wage it, how to maintain and use our faith throughout it, etc. We need to learn from these accounts. While in Salt Lake today on a short visit, I dropped in to the nearest Deseret Bookstore (11th East on Fort Union Boulevard - south part of town) just to "look." To my amazement, two wonderful LDS authors were there signing books. John Bytheway, who has long been a source of both entertainment and inspiration, was there with his two incredible collections of stories from LDS pilots, Supersonic Saints: Thrilling Stories from LDS Pilots and Supersonic Saints 2: More Thrilling Stories from LDS Pilots. Had a nice chat with Brother Bytheway and got his signature in a stack of books I'm using as gifts. Then I met Deborah Pace Rowley, whose most recent book, The Miracle of the Wooden Shoes, is beautifully illustrated and inspired by the story of her father (or was it grandfather?). She's very eloquent and kindly shared some of her experiences in writing this book. Was glad to buy a couple more gifts and also got another of her books, Family Home Evening for Newlyweds, for some newlyweds to be in my life. This was a win/win visit. I met some delightful authors of LDS books and got some good gifts, while Deseret Book nabbed a big chunk of my Christmas budget. Ah, the curse and blessing of impulse buying. I'll have more to say about these books once I've had a chance to read them. But they look great - and I know enough to be confident in giving them as Christmas gifts to some family members. Here are two causes, one LDS and one non-LDS, where I hope you'll consider donating. The first is the scholarship fund of the BYU Chemical Engineering Department. You don't have to be an alumnus to appreciate what an engineering education can do to help young people make a difference in the world. Help some aspiring students get all the education they can with a donation to Chemical Engineering Department. I'll be at BYU on Tuesday to help with a meeting of the BYU Chemical Engineering Alumni Society which works to raise scholarship funds and improve networking among alumni. A very practical cause. I'll be getting details on donation routes shortly (you can contact me at jeff at jefflindsay.com if you wish). On the other side of the world, a very different networking organization needs your help. I am inspired by the mission of a man known as "the Gandhi of Innovation," Dr. Anil K. Gupta of India, who has recognized that many rural farmers, housewives, craftsman, and others in India are unrecognized inventors. They have been solving practical problems in new ways, developing new devices, finding new uses of plants, etc., but their work has rarely been documented and rewarded, only exploited. He's out to fix that problem. Twice each year Dr. Gupta leads teams of volunteers on week-long barefoot treks through rural India to scout for innovations, document them and their origins, and help local inventors gain recognition and financial rewards for what they have developed. Scouting is followed by connecting inventors and product opportunities to businesses that can help in commercializing and bringing financial reward to the originators. What a great concept! The networking aspect of his work is expressed in the Honeybee Network. You can subscribe to this network and receive their newsletter. I joined recently as a "supporter" for just $50. At my request, Dr. Gupta has added PayPal to their Website to make it easier for us to join and contribute. I learned of Dr. Gupta's work as part of preparing a book, Conquering Innovation Fatigue (my co-authors are Cheryl Perkins and Mukund Karanjikar; John Wiley & Sons is publishing this in 2009). I have been in communication with him and others in India in learning about innovation efforts in that visionary country. A small donation can really make a huge difference there in helping clever inventors gain some benefit for their work. I think the two opportunities share a common theme: helping others improve their prospects in life through the excitement of engineering and innovation. Tim Malone of Latter-day Commentary has prepared an informative report on Top Ranked LDS Blogs, considering solo blogs, group blogs, and LDS websites. I'm surprised that my little Mormanity blog was relatively high in the solo blogs and the my LDSFAQ (Mormon Answers) section of JeffLindsay.com made it in the top 20 for LDS Websites. This was based on Alexa, whose ratings don't necessarily represent actual hits or search engine visibility, but it's worth something. I realized today that Latter-day Commentary was not in my blogroll to the right. Just fixed that defect. Update, Nov. 7, 2010: In light of new information, I am tempted to withdraw this post, but will keep it here for instructional and historical purposes. Several things have changed. First, I've been presented with convincing evidence that some publications before the Book of Mormon was published had mentioned elephant-like creatures in the Americas, so it's possible that Joseph Smith could have been exposed to that information. Further, the Wikipedia article that mentioned a very late extinction date for elephant-like creatures has been changed to reflect the more commonly accepted much earlier date, and there have been valid questions raised about the reliability of the information it originally cited. So for now, I think the elephant/gomphothere issue is suspect and weak. The Gomphotheres are a diverse group of extinct elephant-like animals (proboscideans) that were widespread in North America during the Miocene and Pliocene epochs, 12-1.6 million years ago. Some also lived in parts of Eurasia and Beringia, and following the Great American Interchange, in South America. From about 5 million years ago onwards, they were slowly replaced by modern elephants, but the last South American species did not finally become extinct until as recently as 400 CE. Gomphothere remains are common at South American Paleo-indian sites. One example is the early human settlement at Monte Verde, Chile, dating to approximately 14,000 years ago. The cited references above are (1) Palmer, D., ed. (1999). The Marshall Illustrated Encyclopedia of Dinosaurs and Prehistoric Animals. London: Marshall Editions. pp.239–242. ISBN 1-84028-152-9, and (2) Prado, J. L.; Alberdi, M. T.; Azanza, B.; Sánchez, B.; Frassinetti, D. (2001), "The Pleistocene Gomphotheres (Proboscidea) from South America: diversity, habitats and feeding ecology", in Cavarretta, G.; Gioia, P.; Mussi, M. et al., The World of Elephants - Proceedings of the 1st International Congress, Rome October 16-20 2001, Rome: Consiglio Nazionale delle Ricerche, pp. 337–340, ISBN 88-8080-025-6, http://www.cq.rm.cnr.it/elephants2001/pdf/337_340.pdf, retrieved on 25 July 2008. A related reference of possible interest might be the Hueyatlaco section of "The Solutrean Connection Question" by H. Blaine Ensor. For pictographic evidence of elephants in the Americas, see "The Elephant and the Book of Mormon" by Glen Chapman. A hat tip to A.L., who kindly send me an article about gomphotheres eaten by humans at Monte Verde. Whew, I'm glad I got through a whole blog post without mentioning Prop. 8! This week, my young son gets on a plane to Taiwan, where he'll spend the next 22 months of so sharing the Gospel with the people of that great nation. I'm very pleased with the experience he has had at the Missionary Training Center in Provo. Such wonderful, caring people. A couple weeks ago he played the piano to accompany a female vocalist (another missionary) for a large devotional at the MTC. How delighted I was to receive a DVD in the mail with a professional-quality recording of the performance, including 3 different camera angles with smooth transitions. Sadly, I threw away the cover envelope before I realized what a personal, thoughtful gift had been sent - I somehow thought it was a standard CD or something that all parents got. No, someone went to the trouble of recording the performance, editing, and sending us a DVD of a performance by Elder Benjamin Lindsay and a sister. That's all that was on the DVD. Very thoughtful. Anyone know who I can thank? Yes, I'll call the MTC myself and ask. I was also pleased with the whole structure of the program and the care that the Church shows for its missionaries. Thank you! We had one issue where we needed some personal help and were really happy with the caring attitude we encountered. I felt like neither my son nor us were just a number, in spite of the large numbers of missionaries that pass through the Center. One tip for parents with missionaries in the MTC: DearElder.com is a marvelous way to get physical letters into the hands of missionaries quickly - for free (but please donate). My son told me that they have little time for email and that he really prefers physical letters since he can keep them around to read at leisure versus having to rush through an email during limited computer access times. DearElder.com combines the convenience of sending email with the tangible delight of physical letters: they print your letter in Provo and deliver it to the MTC. Nice! They can also send letters (for a slight fee) to other missions for you. They really made life a little nicer for both us and our son these past few weeks. Now just 22 months to go! Meanwhile, I'm brushing up on my Mandarin in hopes of keeping up with my son - an optimistic goal. The hideous terrorist killings in Mumbai should leave us all deeply saddened and concerned. Our hearts go out to the people of India in this time of sorrow and mourning. May each threatened nation find a path to stamp out the terrorists that seek to enter its borders and create mayhem. This year I have made many more friends from India, and have had the privilege of communicating with some visionary leaders in India's ecosystem of innovation and technology transfer. I have come to greatly admire that nation and the spirit of so many of its aspiring people. They have some of the world's finest scholars, finest humanitarians, and finest artists. There is such a desire for that nation to life itself and its people. This devastation by its enemies -- the enemies of all who love freedom -- pains me terribly. May those fiends be captured and brought to justice, and may we find ways to prevent such atrocities in the future. Are any of your directly affected by this, or do you have loved ones in Mumbai or the area? In my last post, Mike Parker pointed to MormonMonastery.com for some good temple-related resources for Latter-day Saints. Interestingly, just moments before I had added a link from that site on my LDSFAQ page about LDS Temples. The link was to an interesting article by John Lundquist - more on that later. The book that may have helped me most appreciate and enjoy the LDS temple was actually written by a Jewish scholar. The book Sinai and Zion: An Entry into the Jewish Bible (Minneapolis: Winston Press, 1985) was written Jon D. Levenson who was at the University of Chicago at the time, but now is at Harvard. I read his book while finishing graduate school at BYU over 20 years ago. On page after page, I encountered what seemed to be possible evidence that ancient Temple practices - covenant making, symbols, meanings, themes - had been restored to some degree in the modern LDS Temple. Levenson's book is out of print, sadly, but a related summary of information about the ancient Middle Eastern temple concept is available online in John M. Lundquist's scholarly article, "What Is a Temple? A Preliminary Typology" (PDF link), originally printed in H. B. Huffman, F. A. Spina, and A. R. W. Green, eds., The Quest for the Kingdom of God: Studies in Honor of George E. Mendenhall (Winona Lake, Indiana: Eisenbrauns, 1983), which was republished in Temples of the Ancient World, ed. by Donald W. Parry and Stephen D. Ricks (Salt Lake City: Deseret Book and FARMS, 1994, pp. 83-118). While Lundquist's article is not explicitly about the LDS Temple, those familiar with LDS temples may see fascinating evidence for ancient roots. Really, a tremendously exciting paper - at least for some of amateur LDS apologist geeks ("apologeeks?"). The Mormon Temple Ceremony: What Is the Most Helpful Thing for Members to Know Before they Go? I've seen several efforts to provide basic information about Mormon temple ceremony for investigators, but I'm not sure what sites are best to recommend for active members preparing to go there for the first time. What do you recommend as the most useful sites and most useful sources of information to help proactive members? No offense, but I've noticed a lot of you act like you've got your DNA in a wad. Well, that's perfectly natural - and I'm beginning to understand why. Histones, for example, are proteins around which DNA coils. So clever how they assemble and interact with DNA. Groups of these coils link up with the help of other histones to form elegant compact structures, which in turn are assisted by other proteins to form compact zig-zag structures, which are again compacted with the help of other proteins, forming the chromatin that makes up chromosomes. The result of that complex repetitive coiling and folding is a structure that is 30,000 times shorter than the original DNA molecule. With this mind-boggling organization, DNA becomes short enough to fit in the nucleus of a cell, yet is still carefully controlled and organized - not just randomly wadded up and inaccessible when needed. Man, I need some histones for all the information I've got scattered across my desk. As we approach Thanksgiving, thank your lucky mutations for DNA and its brilliant set of organizing tools. And be sure to thank them for your eyes, your vocal chords, your taste buds, your circulatory system, and your otoliths -- the tiny calcium carbonate particles in your ear that play a profound role in the human experience. The brilliance of these minute little accidents of random mutations in our wadded up DNA just makes my head spin. Shortly before the people of Jerusalem would be carried captive into Babylon, the prophet Jeremiah pleaded with them to repent. Proud, self-righteous, confident in their holiness, and materialistic, they rejected his message. But it was directly on target. In randomly reading Jeremiah 22 this morning, I found passages that seemed to resonate with our Zeitgeist. Here are a few of these verses. 9 Then they shall answer, Because they have forsaken the covenant of the LORD their God, and worshipped other gods, and served them. . . .
13 Woe unto him that buildeth his house by unrighteousness, and his chambers by wrong; that useth his neighbour's service without wages, and giveth him not for his work; . . .
22 The wind shall eat up all thy pastors, and thy lovers shall go into captivity: surely then shalt thou be ashamed and confounded for all thy wickedness. . . .
29. O earth, earth, earth, hear the word of the LORD. The Lord spake to us in our prosperity, but so many of us trusted in uncertain riches where thieves (especially those in Washington) can break through and steal, leaving retirement accounts depleted, housing values underwater, jobs cut, and economic outlooks bleak. Many homes and even great empires of wealth have been built by unrighteousness, with loans that could not ever be paid back, or with money that was taken by force from others - trillions of dollars worth, without right and even without accountability. We are witnessing theft at the most grandiose levels ever conceived as the national debt - an ogre that took decades of corruption and greed to accumulate - suddenly doubled in a few weeks, leaving you and your posterity with impossible burdens of debt. What has been sowed must be reaped. Chaos and captivity loom when a nation has its finances utterly out of control. Much will be swept away by the wind and the floods that will follow. May we heed the word of the Lord and listen to the inspired guidance of his living prophets and apostles to know how to live and prepare in such times. Now, more than ever, the world needs the counsel found in the word of the Lord. More than ever, we each need to repent of our sins, increase the level of charity in our lives (both in Christlike love and specifically in care for the needy around us), live frugally, and draw close to the Lord. Outside the Church, most of their peers were against Proposition 8; inexperienced in marriage and child-rearing, they saw no harm in gay marriage. So when our Latter-day Saint singles heeded the call of the church's leaders to take part in the defense of marriage, they, more than any other group of Saints, were swimming upstream. They worked hard. They took risks. And many of them paid a price that is heavy indeed. Many of them lost dear friends -- sometimes with bitter, angry recriminations from people they had once been close to. It seems ironic that these young Mormons were open-minded enough to be friends with people whose lives were so different from their own; but their friends, in the name of tolerance, could not remain friends with Mormons who merely stood up for their faith. If the situation had been reversed, if Prop. 8 had failed, these LDS young people would not have rejected their friends who voted to repudiate the meaning of marriage. And if they had, would they not have been condemned as bigots, for being unable to tolerate someone else voting his conscience? I have been more fortunate. All my gay friends who might have repudiated me for supporting Prop. 8 had already condemned me long ago for standing by a Christ-centered, prophet-led church. The gay friends who remained at the time of the vote already knew my views, and our relationship continues. While I can understand some of the frustration of the gay community over society's desire to protect traditional marriage and not change the definition of the term, I hope the frustration will not translate into intolerance for those who hold more traditional views and have concerns about the impact of changing the nature of marriage. I can also understand the frustration felt over the role of Latter-day Saints and other groups in actively standing for their beliefs in supporting Proposition 8. What saddens me is the assumption from some of the anti-8 activists that anyone supporting Prop. 8 must inherently be a hateful bigot. There are legitmate arguments that can be made on both sides of the debate, and legitimate reasons for differences. To transmute those differences into bigotry toward the alleged bigots is a sad abandonment of civic responsibility. Thomas Sowell on Tolerance and the "Right to Win"
I've already come out and let people know I'm a Mormon. Now I'm really putting my neck on the line by coming out as a fan of Thomas Sowell, the black intellectual who refuses to fit stereotypical expectations. His recent column, "The Right to Win," raises some interesting questions about the Proposition 8 backlash against blacks and Mormons. Just got an exciting email from my son learning Mandarin the MTC. He's part of the first batch of missionaries to have the Church's new 3-column Book of Mormon with Chinese characters, pinyin (a phonetic representation of Mandarin characters), and English. This is a tremendous boon for missionaries and others comfortable with one of the two languages wishing to understand the other. It will also allow Chinese learners to read the Chinese out loud. Very nice tool! Over 5,000 chemical engineers are gathered in Philadelphia this week for the big annual meeting of the American Institute of Chemical Engineers. Some early risers will be joining a Christian fellowship breakfast tomorrow Wednesday morning, Nov. 18 (6:30 a.m., room 301 of the downtown Marriott) where we'll hear a message from Professor Harry Ploehn of the University of South Carolina (he's Associate Dean for Research and Graduate Studies, College of Engineering and Computing). I've been to these events in the past and have found them to be inspiring and thought-provoking. In spite of some fundamental differences in some theological areas, Catholics, Protestants, Mormons, and other Christians who take Christ seriously have some remarkably similar experiences to share and often benefit in seeing just how broad the common ground is. I hope to share some interesting insights as I did last year. If, as I fear, society gradually becomes increasingly intolerant of devout Christians, I think the common ground may become even broader and perhaps more firm. Nothing builds fellowship between Christians like a sold-out Coliseum and fresh pack of hungry lions. Speaking of meals, there will be some great food at this breakfast - though a freewill donation of some kind (the $20 kind) is hoped for. The Gospel: Easy or Difficult? Stepping aside from the controversies with our critics in California for a moment (may there be reduced anger and increased understanding on both sides), I'd like to address the "difficult" nature of living the Gospel. The world and some Christians looks at the sacrifices required by the Gospel and sees a boatload of difficulty. Fidelity, tithing and other financial sacrifices, kindness toward enemies, hours of service, going to Church instead of partying, and other expectations counter to the desires of the "natural man" may seem difficult and unreasonable to some. In the Mormon flavor of Christianity, some of the additional "opportunities" like giving up alcohol and tobacco and holding Church callings can make things seem even harder. On top of that, the growing gap between Christian faith - particularly the LDS Christian faith -- and the rest of the world can give us a sense of isolation and risk, especially when ancestral memories of angry mobs are triggered by scenes of hostility today. When one considers the call of Jesus Christ to follow Him completely - as in Matthew 5:48 where He asks Christians to "be perfect, even as your Father in Heaven is perfect," well, it seems to be an impossibly difficult and overwhelming standard. But is living the Gospel really difficult? There are painful moments, yes, as there are in every human life, including the ultimate loss of death. Difficult - compared to what? Compared to not knowing our purpose in life and who we are, to know knowing and feeling the love of God, to not having the companionship of the Holy Spirit, to not knowing that we and our loved ones will be resurrected and reunited? The difficulties of this journey seem well worth the great joy and blessings we receive in the Gospel. These are great blessings, but still, is living the Gospel difficult? Difficult for whom? That is the real question. Here is a great answer I found this morning from the last General Conference in the talk of Elder Lawrence E. Corbridge called "The Way." One of the most popular and attractive philosophies of men is to live life your own way, do your own thing, be yourself, don't let others tell you what to do. But the Lord said, "I am the way" (John 14:6). He said, "Follow me" (Mark 8:34). He said, "What manner of men ought ye to be? Verily I say unto you, even as I am" (3 Nephi 27:27). Don't think you can't. We might think we can't really follow Him because the standard of His life is so astonishingly high as to seem unreachable. We might think it is too hard, too high, too much, beyond our capacity, at least for now. Don't ever believe that. While the standard of the Lord is the highest, don't ever think it is only reachable by a select few who are most able. In this singular instance life's experience misleads us. In life we learn that the highest achievements in any human endeavor are always the most difficult and, therefore, achievable only by a select few who are most able. The higher the standard, the fewer can reach it. But that is not the case here because, unlike every other experience in this life, this is not a human endeavor. It is, rather, the work of God. It is God's work and it is His "glory ... to bring to pass the immortality and eternal life of man" (Moses 1:39). There is nothing else like it. Not anywhere. Not ever. No institution, plan, program, or system ever conceived by men has access to the redeeming and transforming power of the Atonement of Jesus Christ and the gift of the Holy Ghost. Therefore, while the Lord's invitation to follow Him is the highest of all, it is also achievable by everyone, not because we are able, but because He is, and because He can make us able too. "We believe that through the Atonement of Christ, all mankind [everyone, living and dead] may be saved, by obedience to the laws and ordinances of the Gospel" (Articles of Faith 1:3). The Lord's way is not hard. Life is hard, not the gospel. "There is an opposition in all things" (2 Nephi 2:11), everywhere, for everyone. Life is hard for all of us, but life is also simple. We have only two choices. We can either follow the Lord and be endowed with His power and have peace, light, strength, knowledge, confidence, love, and joy, or we can go some other way, any other way, whatever other way, and go it alone -- without His support, without His power, without guidance, in darkness, turmoil, doubt, grief, and despair. And I ask, which way is easier? He said, "Come unto me, all ye that labour and are heavy laden, and I will give you rest. "Take my yoke upon you, and learn of me; ... and ye shall find rest unto your souls. "For my yoke is easy, and my burden is light" (Matthew 11:28-30). Life is hard, but life is simple. Get on the path and never, ever give up. You never give up. You just keep on going. You don't quit, and you will make it. I bear record of Him, even Jesus Christ, that He is the Son of the living God, He is the Bread of Life, He is the Truth, He is the Resurrection and the Life, He is the Savior and the Light of the World. He is the Way, the only Way. May we have the good sense to follow Him. In His holy name, even Jesus Christ, amen.